I'm about out of achievable bucket list items and time in Austin! I realized the other day that I have done better at exploring Austin than any other place I have lived. I am taking that as a good lesson. I have loved planning what to do and then making it happen. I have decided I will take this same path once I move to Winston-Salem. It will be especially important since I plan to stay there and I want to like it and be happy. I'll need to find new routines, new friends, new favorite places. It is exciting but a little daunting at the same time. Maybe Austin was a good warm up. After I went to Mount Bonnell this week I went to Mayfield Park. The park is actually an estate originally used 100 years ago as a summer home. 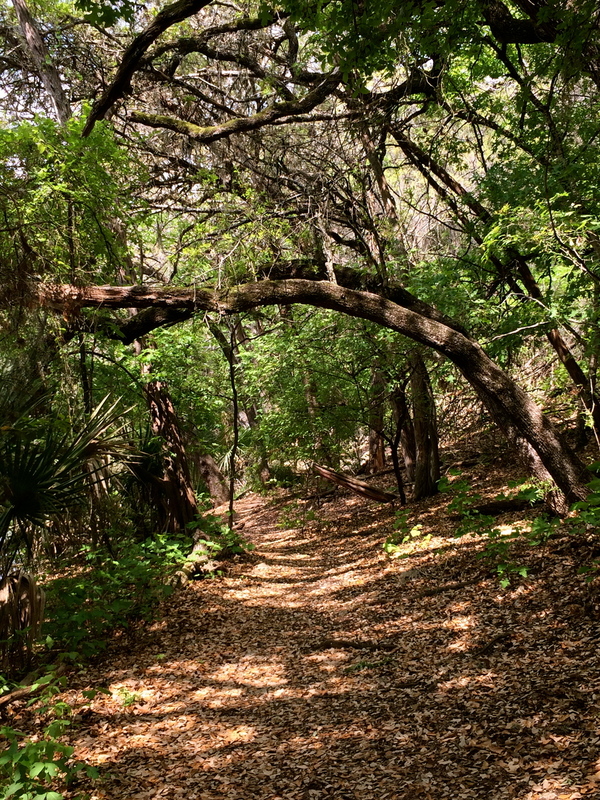 It was given to the city of Austin by Mary Mayfield Gutsch in 1971 for everyone to enjoy as a park. The home is on the National Register of Historic Places. The estate includes the cottage, 2 acres of cottage gardens and 21 acres of nature preserve with hiking trails. The land runs along the water (I have no idea what it is called). Wouldn't this be a great house? It is across the water from the park. Can you see the basket swings on the bottom level? They are hard to see but they have green and blue fabric cushions if you can pick that out. I could sit out there and read all day! 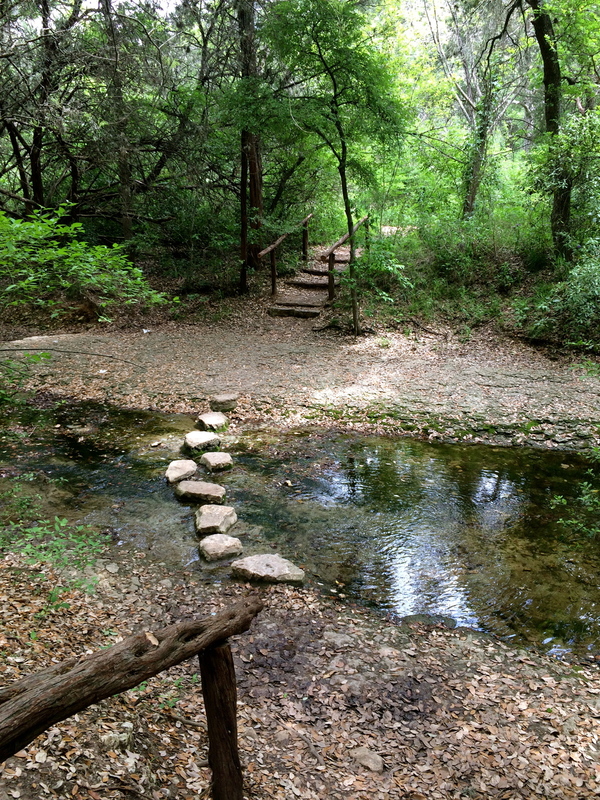 Here are some pictures from the hiking trails. The gardens are beautiful. You can rent them for a party and I think it would be a perfect place. They have quite a few ponds. I couldn't get too many photos as there were a bunch of workmen there cleaning it all up. I also didn't have my good camera, so there are all with my iphone! The best part of the park for me is they have peacocks! They call them peafowl on their website. I learned just now that the males are called peacocks and the females are called peahens. The original owners were given a pair for Christmas in 1931 and most of the current birds are descendants of those two. Can you imagine getting that gift on Xmas morning? There are around 24 birds, male and females, that live on the grounds. They were absolutely beautiful. And terribly noisy! They are loud and sound like someone screaming or crying! I could hear them the whole time I hiked through the park! When the male has their long tail closed they remind me of a bride with the long train of a dress flowing behind. The blue of their necks is just stunning. So that is Mayfield Park. You may be thinking why is she sharing all this random stuff rather than food and recipes? Well, many things contribute to good health. Getting outside, learning and experiencing new things, being inspired, having a hobby like taking pictures or hiking, are all important parts of health. Good food alone won't make you healthy. Finding things that inspire you, delight you, are the key to a happy life. For me, getting outside, going somewhere new, taking pictures, seeing the beauty of nature, are all crucial to feeling good and staying heathy. You have to find your thing and then go for it!